As our parents get older most likely they are not eating the same foods they once enjoyed. Tastes change, certain foods become difficult to digest, or chew. Dad may still crave a juicy cheeseburger, but it’s impossible for him to properly digest it. In some cases seniors lose their ability to enjoy food because their sense of taste or smell is diminished. So they enjoy it less and therefore eat less. In this case they may not be getting the nutrients needed for their health. Maybe you are now their cook and prepare all their meals. The dilemma becomes what to buy and how to find foods and prepare meals they will enjoy. Senior care in Toronto calls for making some changes to their daily diet. Here are some tips to create a senior-friendly grocery list. Search out dark green leafy vegetables like spinach and broccoli. Add in squash and steam those fresh vegetables that can be easily chewed and digested. Pick out their favourites. Soft fruits like ripe pears, bananas and peaches add a sweet treat for dessert or snacks between meals. Always keep some frozen berries in the freezer. Hot oatmeal with added fruit is a great way to start the day. Try buying and incorporating whole grain breads and pastas for lunch and dinner. If your “old school” senior balks at that change, mix those together with pastas they prefer to help reduce cholesterol. Not all fats are bad for us or for seniors. Cook with a bit of olive oil or add a few drops to their salads. If an important part of your senior care in Toronto is getting your parent to increase some lost weight, this is a healthy way to do it. Whip up some guacamole or slice avocados and add them to sandwiches or salads. If your senior has lost an interest in meat, there are other alternatives. Who doesn’t love sweet potatoes? Mash them, bake them, whatever way they will eat them. Do include certain cuts of chicken which can be braised, like legs. The meat will fall off the bone and be easy to chew. Choose lean ground turkey or beef. Don’t forget eggs, especially soft-boiled. This can be a problem for senior care in Toronto if digestion is an issue. Substitute almond milk for whole, and find probiotic yogurt. 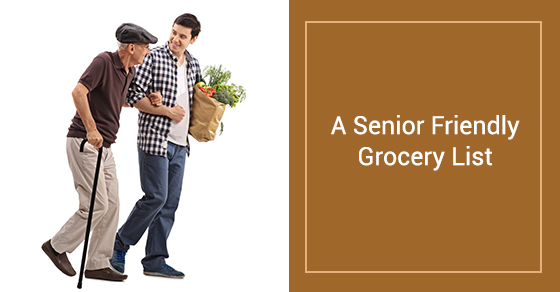 Whether you are doing the shopping for a senior who can no longer get around, or you are preparing all their meals, these suggestions will help provide a balanced and healthy diet for them. If you need some assistance with senior care in Toronto contact the professionals ready to help.